Static Control’s Ken Lalley with The Recycler’s Stefanie Unland. 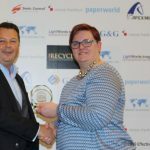 The company received the Customer Service of the Year Award at The Recycler Awards, during this year’s Remanexpo show in Frankfurt, Germany. 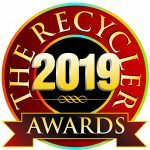 It was the second time that Static Control had been named winners of the award, and the latest in a remarkable run of success that has seen the company win a Recycler Award every year since the ceremony’s inception in 2015; previous accolades include Innovation of the Year, and being named Supplier of the Year twice. 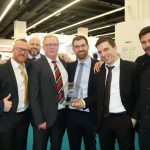 The award was “the zenith” for the company during a successful Remanexpo show, during which Static Control played host to a consistently packed stand, with many face-to-face meetings between customers and sales team members. 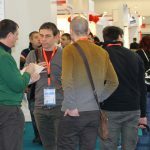 Static Control’s General Sales Manager Paul Needham presented information at the show about the DecaBDE issue rippling through the industry. “The issue is widespread, and it impacts compatible and remanufactured cartridges, along with components. 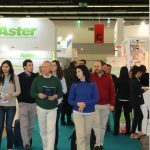 As an industry, we must work together to hold plastic suppliers to the standards that have been set forth in environmental regulations,” Needham explained, adding that Static Control’s European cartridge and component offering complies with RoHS and REACH standards. 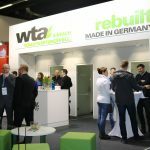 Remanexpo 2019 – one week to go!